The Apple App Store only shows the reviews and ratings for your particular country and not all countries. So we have copy/paste all reviews from all countries, not just the best ones, of our Bookkeeping program and our Bookkeeping Pro program here for you to review and help to make your decision. Always remember to contact our support team directly with any issues or suggestions as the reviews on the App Store are not sent to us and we have no way to reply back to reviewers on the App Store. I run a trust fund, a holding company and a non profit organisation all from this app. The input is simple, the options are endless, the reports are comprehensive and support is second to none. It's ideal for simple bookkeeping. Truely outstanding The only ipad accounting app with everything It may not be pretty but it works very well If you want a true accounting app this is it. I've been using Bookkeeping for about 3 years now and never cease to be amazed by just how great this app really is. If you want to justify the purchase of an iPad or iPhone, then this app is the reason. I previously paid over $1,000 for a PC accounting package with some of the features of Bookkeeping, but have tossed that one away as this app is so much better and easier to use. I can switch between cash and accruals at will, and use multi-currency. I produce my invoices and mail them out to customers directly from my iPhone (or now, from my iPad mini). Brilliant stuff. As a user/semi-retired ERM-FMS consultant, this app has proven to be the perfect solution for our multiple businesses across two countries. It has also allowed us to maintain all of the necessary legal paper-trails of this complex world, and in varied industries (Property management, Private clinical practice, IT consulting). Its simplicity and import/export mechanisms are a boon to us, and have saved us a fortune in unnecessary extra personnel costs. I dumped MYOB when I found this app. Cost me 8% of the price, easier to use, better than equivalent modules, absolutely fantastic support. Rock solid performance. Five out of five stars. I didn't think it could get any better, but the new features just keep coming. It's awesome! Jan2014 Update - My wife is entering expenses on her iPad syncing back to mine. Still very happy with the program. Stable and Flexible. I have used Bookkeeping 3 for a couple of years and appreciated the support, flexibility and frequent upgrades. Had a minor glitch converting to Bookkeeping 4 which was my fault but the support was very prompt and all is working well. The Syncing between the iPad and iPhone is faultless. Online user manual is reasonably thorough with out being too heavy reading. This is a fairly comprehensive app with a lot of flexibility so be prepared to spend a few hours tailoring to suit your use. I use it fairly heavily for quotes, orders and invoicing and very pleased. Used MYOB for 15 years and this is as good but totally mobile and a fraction of the price. Put simply, this is the best accounting app I've come across. Will be advising my clients to use it!!! As a previous comment suggested...beats the hell out if MYOB!!! This app is easy to use & quite versatile. Able to do all areas of accounting. Very pleased. Help is quick & the info given covers the topic well. This is just brilliant. A lot better than Bookeeping 3 and that was amazing. I don't think many other apps have had the amount of effort put into the design as this one has. You guys are So innovative. Just total commitment and passion for your product. I love it. The main screen where it keeps a tally of suppliers purchase orders customers invoices etc is a top idea. Nothing but admiration for the work that's gone into this product. This program gives me the feeling I'm in full control of my business and the mobile aspect is the direction I want to go because invoicing and recording information on the go is definitely a huge time saver. You guys are geniuses. Thanks for an awesome application. It's worth the money considering the thousands of hours put into the design. The only thing I'd like to see is a choice of more colour schemes as the visual element is important and a factor for the cosmetics of the program. It is a factor when I choose to buy an app but its still worth the 5 stars...Great product guys. This Bookkeeping app is great. I had Bookkeeping3 and upgraded to Bookkeeping4 pro. Well worth getting. Now if I leave my iPad at home I can invoice on the job with my phone. The Bookkeeping4 app works great. This is a full featured accounting software for apple. Support is excellent. Price may seem a little high but it is well worth to get a handle on your business and finances. Get it! I am a long time user of this software. I find it extremely easy to use and so convenient on my iOS device. Thoroughly recommend. I have just become treasurer of a cycling club and this app is perfect for keeping our accounts. No monthly fee and excellent support. I love this app. It keeps improving every time. Please keep up the good work. Keep improving our lovely app. The best bookkeeping app on the mobile platform, getting better with each update. Keep up the good work! This is the best bookkeeping app currently. I have bought bookkeeping apps but there is nothing like this. This app is simply great. I've been using this app since version 3 and continue to be very happy with both the app and the great support I get from Warby. I wish I got so much support from some of the more expensive pieces of software I use!! I have no problem in recommending this to anyone with a small business or club account to run. Great program, excellent price and no annual charge, pay once and that's it. Tried other program's but found they didn't have the depth. I'm a sole trader and find this really helps ESP as I can invoice my customers. All reports and invoices can be fully edited which I find great. The only thing I would like is to have a CIS tax option for sales. Worth every penny as other program's are expensive. I recently purchased this app & found very useful. The initial opinion that this app is good enough for small enterprises & individual,s business running. This one s user friendly & lot of reports can be generated. This application is worth the cost. It is loaded with features and will deliver more than what you expect. Good app. The last upgrade deleted my info but I was able to restore it and eventually sync it back up with my iPhone. Other than that rigamaroll to get everything back to normal after the update everything is good. Not user friendly at all! Help features are useless. As a small business owner, the program is a powerhouse! It does everything that my other program does, but without the outrageous fees that I was paying for yearly updating. The tech support is timely and curteous. The connectivity between other devices is super easy to use. You get a lot of bang for your buck with this app. I run a small academic services business and have been searching for an accounting app. I've been using several different apps, with the most recent app being Kashoo. Unfortunately, like the others, it requires a yearly subscription of $49.99. I started looking and found this app. The $50 price was more than fair given what it is capable of. The layout was confusing at first, but they provide "quick" buttons to accomplish sales and expenses. Both of which I use often. This app covers the basic needs of my company through quick expense and sale entries. It also allows you to keep track of income from specific customers. All information is filtered into a basic profit and loss report for quick reference. All information can be synced to dropbox which is a huge deal for me. I like to know it's saved somewhere in case I lose my iPad. Other reports are great for taxes. I also noticed an inventory area where you can keep track of products you are selling. I do not sell products as of yet, but this will be incredibly helpful in the future. The only downside is the learning curve required and the difficulty of navigation. Navigation of the menu is not complicated once mastered, but there is a learning curve. Overall, this is the best accounting app I've come across. I use it everyday! As a small business owner that has transferred all business programs to the iPad, finding an accounting program was a challenge. That was over a year ago. But I had found bookkeeping 3.0 back then and have been using it ever since. That is until I upgraded to bookkeeping 4 Pro. As with the earlier edition this program is a no brainer, best in class. I highly recommend it to anybody that wants to free them selfless from the desk and virtually take care of all your accounting needs on the go. Plus the company support is second to none. Easy to use, friendly-user interface. It provides give the information I need in reports, taxes paid and collected, etc. The best of this application is the support you receive form the warby team. I was recently offered some part time consulting work. I had to quickly buy an app which would produce professional looking invoices and keep track of payments for me. Also, it would have to be easy for me to learn how to control it. I downloaded this app and after a few days of learning and testing I am now producing invoices, emailing them as attached PDFs, and recording cash receipts as they arrive - all on my iPad. I am a happy user of this app. Used for over two years. Data base stable. Regular updates. Ex MYOB user for over 15 years and nothing bad to say about MYOB. Bookkeeping is portable and a fraction of the cost. Very comprehensive and useable. The best support I have experienced with any software or App. Quoting, invoicing, purchases and expenses on the go. Good once I got used to it. Love it. Would be great if I could apply discount in the quick entry page. This app does everything you could ask of an accounting program. Full functionality with lots of options. The email support is also very responsive. Thoroughly recommend this app for anybody needing to get their accounts in order. I have used this app for two years now and find it to be an excellent bookkeeping app for the club I am treasurer of. This is an outstanding bookkeeping/accounting package. It does everything that the bigger desktop packages do but comes on your ipad. Great job developers and keep improving the UI with each update. This is the best accounting app, as good as myob just on touch screen. Great app, for anyone who has any clue about book keeping...my help requests have been answered promptly! Not at all intuitive and not adaptable or customisable. It seems to be just what I wanted but it won't allow me to import my customers from iPad contacts. I can't add a price in invoicing. Not able to disable pin to log into the app is a real annoyance. Have looked at the help file but none of these issues are dealt with. Help file is actually very basic. Would be nice to contact the developer to ask for help but unfortunately no contact details. I'm very disappointed with this app and it would be really nice to be able to get my money back but as I can't contact developer I guess I'll just chalk this down to one of those wastes of money. For a business that does not have an office, this software has not only saved me time and money, (very cheap compared to other accounting software) but has allowed me to get paid quicker. I paid $800 for MYOB. Dumped it and now use this app. Does every thing I could do before, but easier. And I don't have to pay for an upgrade every year to get the new tax scales. I now have all my accounting details with me on my iPad. I enter purchases on the spot and sent an invoice before I leave the job. Support is great. This app is the best thing that ever happened to my business. Certainly regret this purchase. I wanted something easy to use and intuitive. This app requires far to much of my time trying to work it out! Will delete. Was great before. You know you are on to a good thing when these things happen. 1. You email a support question and get a straight answer back same day. 2. Suggestions you make appear in the next release. If your looking for a mobile solution, this seriously fits the bill. For me it has replaced MYOB. and left no gaps. Best business dollars you will spend. If you understand double entry book keeping, then this app does the job. The only improvement I would like is a "budgeted year to date" column on the comparing the budget to the amount spent. As it stands I have to make a rough estimate as to how far through the FY I am and then calculate whether I am ahead or behind budget. Other than that, it works well. This is fantastic and easy to use on the go.. Fantastic for all mobile small businesses. A great feature would be able to take a quick photo of your receipt when entering a quick purchase ! Sceptically yet trepidatiously I downloaded this last night thinking that if all I got was an efficient General Journal I would be happy. Of-course I got what was stated in the write-up. I am using it to run both my personal finances and my small business. Up until now I haven't found any Mac or Linux accounting app that could come close to the functionality of my PC apps and yet this app looks like it can replace them. Today I am loading information in JPY as I progress through the day, saving me from having to make notes and then transfer entries into a desktop system later in the day, as would be the norm. Really handy having the whole package on me. The greatest feature for me is the flexibility the app offers, in that I can edit past entries, and I can streamline the app to handle a small cash system without feeling like I have to make a new program. Also, when making general journal entries I can provide and view more information than my PC app allows. On the business side, it appears to have what my PC apps have… not bad for 20 bucks. Oh, and being portable means my MAC keeps editing and rendering while the accounts get done. I'd say this is the most useful app I have downloaded… and to think I was about to give my iPad away last night. Edit: Had lots of questions. Received quick and thorough replies. I guess you can tell I'm a happy camper. I wasn't happy with the limitations in my computer bookkeeping software. It was going to cost too much to up-grade then I found bookkeeping and thought I would give it a go. It is brilliant. Dose everything it said. I backup to Dropbox and can email invoices while at the job. I can print to my HP office jet 8500. I love this app it has made invoicing and keeping up to date easy. Even import bank reconciliations works and was easy to setup. Excellent Really easy to use and generate reports, statements and invoices. This app is relatively easy to use. I was able to figure out all of the features I needed to use within an hour of sitting down and playing with it. It produces professional looking quotes and invoices for my customers and has all the features of the big name accounting software. The only limitation is the ability to print without Internet access, which is more a limitation of the iPhone and not the software, and only a problem if you need to print away from the home or office. This bookkeeping app includes all the functions and more you could possibly ask for. It's so simple and smart I picked it up straight away. I was dreading having to learn MYOB for my new business but I won't be needing it now. Having it on the iPad is great, I quickly enter as I go. It also easily and successfully backs up to Dropbox. I love it, and really appreciate all the work and thought that's gone into. Quick support response and so far 100% reliable. Have been using this app for a couple of weeks and it is fantastic. Small learning curve which understandable considering there are short courses for other bookkeeping packages. Support and response time is excellent. Warby software support are very helpful. The reports are great and the data is always with you. You can see at a glance who is late with payments and who you have to pay, you can invoice and email straight from the app. This app is replacing MYOB and at a fraction of the cost. Well done. What awesome value. Great logical accounting package. This is by far one of the best I have seen. I'm dumping MYOB for this. Far easier and more comprehensive to use. Being able to do it all on an IPAD is fantastic. Handles GST and foreign currency easily. Has a good user manual a well. Now if they can just include in the package a stockmarket trading and portfolio management function I would be in heaven. I've only just downloaded the app, so far it looks very comprehensive and was just what I was after. For the price its a bargain and glad I decided to go ahead with this app as opposed to quicken. Seeing the comprehensive list of updates sold me. Only one thing, can you please make it a bit more friendly on the eyes. The colour scheme and graphics need some work. This really is an incredible accounting application. Over the years, I've used MYOB, QuickBooks and Microsoft Accounting, but this beats them all. To get multiple-currency functionality in other accounting packages, you have to pay in excess of $1000, but this one includes it! I'm a sole trader and can't really afford that sort of money. Now I'm running my accounts from my iPhone and it's easier to use than any of the others. Support is great. Can't recommend it highly enough. I really like this app because it gives me a chance to do my bookkeeping on the go, and it is professional looking and fully customizable. Thank you for giving me the perfect application to compliment my business needs. I found this app difficult to use. I was after something easy to use and flexible and hopefully capable of catering to an Australian market. It includes lots of features but something very basic - like a function for deleting a book - was missing. I was disappointed given the price. GREAT TO USE ON MY IPAD. Still learning this app but so far it's ALOT more then I need so it's very complete! I agree with the last post. The app is great. If it would sync with the cloud another iPod or iPhone devices it would make it even better. takes sometime to learn but over all great app! I'm probably more critical than most on reviews but here goes. This program is solid. It's very flexible to international businesses and it seems to be geared for small businesses but get a little lost in detail. Some of it is much more complicated than it needs to. Currency for example should be just a preference setting yet you see it in every form making it more cluttered and busy than it needs to. Given your a small business, international currencies and their rates should not be much of a part of your business. My biggest complaint is that I enter most of details on my ipad, making for billing away from home impossible since its wifi only. I would of very much liked that my iPhone could be winked with my ipad. I can download it on my iphone for free since I bought it but cannot sink, making billing away from home impossible. That would be my biggest wish for this app is for the info to be stored iCloud and be able to enter from any of my devices like some other accounting apps do. This app helped me completely ditch the laptop and do all my work on the go with my iPad. Very comprehensive list of features, easily adaptable to the needs of my small business. The only other things I would like to see in future releases are: more customizations for reports and sync between iOS devices. This app is one of the best double-entry bookkeeping systems that I've ever used...and I've used far too many for anyone's good. It's easy--if you have a basic understanding of double-entry bookkeeping--and quick. The technical support is fast and responsive and updates with improvements and corrections are far faster than any app I've ever used. This app is great and the team that developed it are even better. Don't waste your money on more expensive apps that do far less, are more confusing and will likely never even consider that little changes that would make your life so much better. This is a pretty good app. I am using it to replace Quickbooks and it does a good job. It is a little complicated and I wish I could remove some of the accounts and features that I don't use in order to simplify. All in all its pretty good. I really love this app its amazing save my time I love it!!!! I run my business with it and it's great for my small consulting company. Excellent documentation and Customer support. Wish all my apps were as good! Huge fan of this app. Easy to navigate and does what I need. Been using this app for some time now and it's the best at what it does. This is a useful app and support is great. I manage a small LLC and rely on this app for its accounting requirements. I removed a star because it keeps asking me to rate the app It is really nice if you know some accounting. Also it uses some accounting conventions from Australia I think I had to look up what trade debtors meant, however if you know general accounting principles you can use this app to keep the books on any small business. I use it to run my cab, website, and storage unit auction businesses. I needed an iPad centric financial accounting app for my business, which is on the go/mobile. I don't know much about business finance, so I had a good friend of mine, who is an accountant, helped me research apps. Of all that we looked at, this one does everything I need and a whole lot more. My accountant friend was quite impressed with the power of this app, and all it can do. I'm thrilled to be able to track my business finances. For the iPad this is the best app for keeping track of your clients/customers. You can keep track of multiple businesses. It has all the features you need. Invoices, reports, statements you name it. I have no accounting education, but I can understand and run my own businesses with an iPad and this app. One of the best things about this app is David, the developer. My questions have been addressed in such a timely manner it's amazing. I've not had this support from an app developer from any other app. You won't go wrong buying this app and the price is extremely reasonable for such a comprehensive program. Take the time it learn it and you'll be delighted with the flexibility and efficiency of the app. Great double entry accounting app. Need basic accounting knowledge using this app. If you have no basics in accounting, do not buy this app. It may be complicated to set it up. This app has all the features your PC bookkeeping system offers but doesn't keep you chained to your desk. Additionally, Customer Support is the finest I have encountered. No frustration, just function. In my opinion after purchasing and trying five of the top financial apps this one is the best. However, it still has a way to go before I would rate it higher. I think my biggest complaint is the difficulty in editing transactions. It also scores low in my opinion when it comes to being user friendly. That said I have not found a single thing that I can't do...eventually. Amazing app! Hopefully it will become more user friendly, but I am really impressed with the power of this app. Ok, this is most certainly a Accounting package that is highly customizable and simple to use. Very user friendly with all the bells of major packages. I would only have one request, please allow sync options not just backup options. Put an option for those that have multiple devices and or multi users to sync to the cloud just like easy books. Make it an additional option so users who don't need this can still do simple backups and imports. Bottom line is this would be a dangerous app if it could sync across multiple iPads and iPhones from the cloud. I used quick books and another app before trying this one. This is very comprehensive yet very easy to use. Highly recommend. Takes awhile to set up but worth the time. Works great accords all devices. Looks great but I have not been able to figure out how to use it productively. Do I need to be an accountant to use it? The app has limited provision for currencies, I cant find currencies like the Zambian Kwacha (ZMK). So my rating of 2 is really a one because I am yet to use it. This app is excellent. You can enter data quickly and accurately. This app is excellent, neatly stores sales, receipts, customers, payments and accounts. Then, puts all the information together nicely. An added benefit is the quickness of email response when you need support! Worth the purchase! Have been looking for a multifunctional app to run my small maintenance business. This does it just right. This is exactly what I have been waiting for a complete accounting package for the iPad. Nicely presented. Easy to use. Basic knowledge of setting up some other accounts program like quick books will breeze you through setting up your different accounts on this app. Well worth the money for all it does. I think the reviews in 2011 are about a previous version as this was very simple to set up accounting system. If you never used any type of accounting then you might need to buy 'booking keeping for dummies' to point you in the right direction, but with this in hand this should be a breeze. There a downloaded comprehensive manual available on their website, again well worth looking at to see all the features offered by this program. Again well done and thanks for making this available at such a great price. This program DOES NOT work, The program CRASHED five hours after it was purchased!! Don't buy this program - total waste of money. Sent them a email, no response !! NOT a bookkeeping package, MORE of an accounting package. This package requires a Degree in Accounting to be operational. As a author of several accounting packages, this package is very good, AND FOR THE IPHONE, great! The best part... No Monthly maintenance fee.. If you do not understand this accounting package, then take some accounting classes at your local college and then you will appreciate this program! A word to the wise!! I bought this app a long time ago. I was able to generate all the reports my accountant needed at tax time. I have used Quickbooks for over 15 years. Don't use it anymore. This app does everything I need for both my computer service and my husband's plumbing business. Would be a bargain at twice the price. I have tried about 6 apps that said they would work for a small business. They don't, at least not for my business. Bookkeeping is a great app-and their customer service is outstanding. I am in USA and they are in Australia so it works out great because they answer any questions that I ask in the evening within minutes-an hour at the most. There is a learning curve but it is well worth the time spent. Expensive and complicated. Too much to enter and discombobulated. Spent hours trying to set up...waste of $16. This is an excellent double-entry complete accounting package for the iPad! Very user friendly and very easy to use. Data entry is quick and reports are well structured. Looking forward to updates with more features! I use this App for my own books, a bookkeeping service. Yes, you do need to know accounting well and it also helps if you've worked with several accounting software packages, but this App. does things correctly (the ONLY iPhone App. that does, I've tried them all) and has quite a few features, for a small App. It is definitely worth the price. The sequential numbers it assigns to your transactions (receipts, sales, payments, Etc.) work great if you need a reference number and tagging to go with your electronic storage of source documents (Evernote, for example). I got this just to enter income and expenses for my ranch and rent house and to keep totals so that I could give them to my accountant at the end of the year and I can't figure out how to set up accounts or enter transactions. I guess it's too late to get my money back. I guess this app may be alright after taking a month or two to figure out how to use it. I have been doing my own accounting since 1990 but it's going to take me a while to figure this one out. Use your own logo? Edit invoice layout? I guess i need to take a course on html editing so i can change my invoice layout. You would think there would be some kind of dashboard so that you get an overall view of your books. This app needs a lot of improvements. Definitelynot worth paying for. Want my money back. Always crashes. It won't keep track of things and has no security and every time you put a code in it crashes. Not even worth a dollar. Don't buy it . Help your self. It has no password and it won't keep track of it . All it is, is. a calculator that's badly design. Want my money back. I have been using this app for over a year now and I love it. It can go with you anywhere. I would recommend this app. Great to have my books wherever I am. It is lacking in reporting. No monthly full sales, or products category sales reports. Reporting feature would make the app much better. Chris BNAC Environmental Solutions Inc. Fairly disappointing that preprinted cheques can't be used. Has absolutely no option to do even basic payroll. One has to reorder and rename all of the accounts to follow North American conventions. Time consuming. Interface doesn't take advantage of the Apple "look and feel" that one expects from such apps. I did not trust it enough to transfer my existing books over. Looking at Kashoo now. Seems to show much more promise. I just bought the software, in other words wasted 25 dollars. I thought that I can use the software for my small business User interface is terrible. I definetely do not recommend this app. This version has implemented the features I requested and many more. Thanks to the developer who listened. I like the ability to generate variety of reports and email them. The redesigning of the interface has made it easy to identify headings and open them. Bookkeeping is now very easy to apply and it does all the bookkeeping you will need flawlessly. If you are a bookkeeper or own a small business, you must install the app. You will surely have your business in your pocket. Good Job Guys! This is easily the most comprehensive book keeping app that I've come across so far. It includes everything that one might expect, such as a basic ledger and a very solid report system, and it goes beyond expectations with many shortcuts for doing the tasks that are most often associated with keeping your books up to date. Furthermore, the developer is very helpful and involved in his work. I've contacted support by email several times, both with suggestions and questions, and time I received a very complete, helpful, and timely response. Several of my suggestions have been implemented and I could not have possibly hoped to receive better answers to the questions I have had. Great support, all your book keeping needs in one, and frequent updates for new features and functionality. 5 Stars. It hurts me to give such a low rating for such an otherwise great and unique app. A big, and not yet solved issue, is that that assets, liabilities, equity etc have set starting numbers, such as 1(000), 2(000), 3(000) etc. This does not correspond to how we do accounting in my country, and is a major pain when dealing electronically with my accountant, since we we end up with different account numbers for the same accounts. I (we) need to be able to customize categories and account numbers, such that an asset can have a number of say 2130 (as it is now, it HAS to start with a 1, so the asset is listed as 12130) This means my accountant has to manually type in my already typed in numbers for each account - double work!! Once this gets solved, it's a 5-star app! Hatte auf meinem Netbook mit GnuCash gearbeitet. Als ich dann mein iPad gekauft habe, habe ich mir mehrere Apps angeschaut. Aber bei diesem hier bin ich hängen geblieben nachdem ich die kostenlose Version getestet hab. Ich bin zwar kein Unternehmer und hab mit Vorsteuer, Überschussrechnungen usw. nichts zu tun. Aber ich möchte wissen, wofür mein Geld draufgeht. Und dafür eignet sich das Programm hervorragend. Klar, wer nichts mit doppelter Buchführung anfangen kann, tut sich mit dieser App schwer. Was mir besonders gefällt sind die "Jobs", mit denen ich verschiedenste Ausgaben im Jahr über Konten (Kategorien) hinweg zusammenfassen kann. Toll ist, dass ich das Programm gleichzeitig auf iPad und iPhone haben kann. Am iPhone erfasse ich unterwegs schnell meine Einkäufe und nach der Synchronisation habe ich die Berichte auf dem größeren iPad-Schirm. Der Support ist Klasse, schnell, und geht auf Probleme und Vorschläge ein! Die Bedienung ist hier und da noch etwas umständlich, weil man meiner Meinung nach zu oft zum Hauptmenü wechseln muss, statt verlinkt zu springen. Außerdem wäre Import aus dem Online-Banking wünschenswert. Daher ein Punkt weniger. Wer Bestellungen und Rechnungen schreiben muss, kann über Variablen praktisch alles auf die Landessprache anpassen. Ansonsten bleibt alles auf Englisch. Wie gesagt, ich nutze es privat, aber der geringe Mehr-Aufwand ist es mir wert. Und dafür ist dieses Programm hervorragend geeignet. hat so ungefähr alles was man sich von einer Finanzsoftware erwünscht: doppelte Buchführung , Kundenverwaltung Rechnung erstellen, Mwst-berechnung inkl. bei Brutto sowie Nettobeträgen Auswertungen usw. bis auf wenige Abstürze( möglichweise weil ich gewisse Templates noch nicht angelegt habe, und das Programm versucht auf die nicht existierenden Daten zuzugreifen). Schön wäre noch eine Fotoscannermöglichkeit, um die Belege zu archivieren. Alles in allem aber ein ziemlich perfektes paket, Ledger(keine automatische MwSt.-Berechnung, keine Rechnungstellung) und easy Books und RingitupPro sind ebenfalls gute Programme, dieses scheint aber allen gegenüber die Nase vorn zu haben, also eine Software für Professionals. It is simply great application and i could not find any like this , It's features ,Functions backup and restore very convenient and easy .And although to me there is no comparioson of price but I think it's Dimond on the price of salt. Good but doesn't have an easy way to pass the cash transactions. No provision for cash in hand account. Good for my company finance controlling. 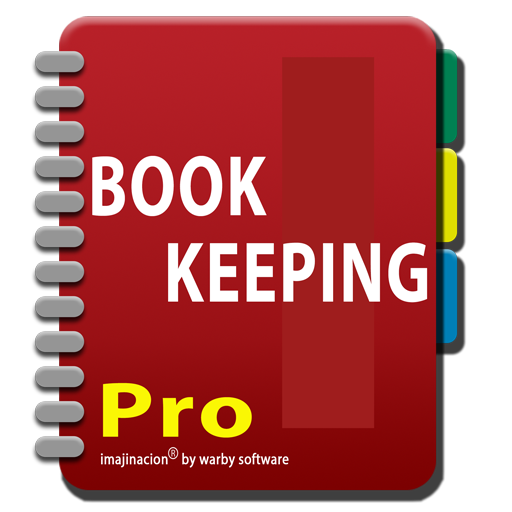 Great app, I am a bookkeeper managing books for multiple clients. You ever watched a scifi movie and see the actor fiddling with some touchscreen device? They look so professional and cool. That's how I am on the job, this app allows me to be super mobile, it's fast, and get the job done, be ready for some self initiative learning, but once u pass that obstacle its greatly rewarding. I would recommend this app to anyone that needs to manage their own books or bookkeepers that work for small businesses or freelance bookkeepers, it will truly make u a one of a kind bookkeeper, The power of the iPad and this app delivers a full 8 hour day work, giving rise to a new generation of bookkeepers with music!! I will be getting a keyboard for faster typing. Best used with spreadsheet software and Dropbox . Bookkeeping is een zeer handig programma voor het bijhouden van een eenvoudige boekhouding op de Ipad. Handige reports en als je het door hebt, zeer gebruikersvriendelijk en eenvoudig. Een aanrader als je een eenvoudig boekhoudprogramma op de Ipad zoekt. This is a great program, easy to use, and does everything they promise and more. Most importantly, Support is EXCELLENT, I had some problems (my fault, not the program) and it was quickly sorted out by the Team. Before I installed Bookkeeping, I searched app store many times and tried many apps but useless. When I found this, it changed my accounts style. I've two suggestions to make it even more useful. 1. Opening balance improvement 2. Ability to show related currency with every account in entry and reports. Love this app! I use this everyday for my bookkeeping and still loving it. Thank you!!! Very good app! Fast soft. support. 5 stars! Отличная прога, быстрая поддержка, доволен на все 100! It's a easy to use software. Will be great if inventory cost can be automatically calculated. This app is excellent. Very easy to use, truly value for money. A little help would seriously be helpful. Like it because its so comprehensive, dislike it because you need an accountant to do your invoicing for you. Unfortunatelly this app doesn't allow to personalize all accounts and adapt it to other specific bookkeeping plans from other countries... for instance it doesn't serve for Catalonia actually under spanish accounting plan... (no comments), so it will be nice a little more free option to selfcontrol... Anyway it is a great app !!! Will you upgrade for chinese font for entering data? When you generate report it doesn't support chinese font, please help. This bookkeeping program, is meant to do the job comfortable and professional, with. Easy in use, higly appreciated. Worthful my spending!! Really impressed with this software. It's a excellent app Thanks guys, This app is really rocking, you guys are really supportive, this app has all features that all kind of business is looking for. It's been a year now I m using this app without any problem. Hope in this new financial year, we will see some more new changes in the app. Also if you can release version for mac, will be great. This app does just what I need (keeping track of sales of multiple items and payments received). I'd previously tried several other apps, some were cheaper but didn't do everything I needed; others might have done but involved costly monthly fees, I'm perhaps only using 5% of bookkeeping's full potential but for me its an invaluable 5%. Great value. Prompt and helpful support too. I have been using this app for a while now and I am delighted with it. I am managing the accounts for two separate organisations, one of which is a registered charity. Entering transactions is really easy and reports are just a few taps away. The app does everything I need, without the the assistance of a desktop or laptop. Backup is a breeze - I use Dropbox. It works flawlessly. The app is very comprehensive and may look too complicated for some people. Don't be put off, you only need to setup and use those features you need. Support from the developer is outstanding. I have tried many accounting solutions over the years, from both big companies and small. Bookkeeping is quite simply both the most cost effective and by far the best solution I have ever used. It isn't often that I review any apps but this app deserves 5 stars all around. The app is flexible enough to cope with our retail business and some of the very odd income tax conditions of the country where we work. The support is outstanding with quick well thought through and illustrated replies. I was a bit worried about the price but its worth every penny and other developers could learn a lot from Warby. Keep up the good work. This little app is brilliant! I use it for two sets of books and Warby support is superb. I have one small issue with the current version, but it doesn't really affect they use of it; it would be really useful if you could opt out of showing zero balance accounts on the Balance Screen and P&L Screen. Best bookkeeping app I've found. Couple of glitches in the current version: - screen slightly misaligned on iPad 2 ( pushed too far to the right) - was not able to change default quantity on sale line item. Very frustrating so I'm not going to use until fixed. 'tis an easy fix so I look forward to that. Not the most intuitive software, but when you get to know it this really is a complete bookkeeping solution. I run my business with just this. Would benefit from a data sync function though. Bookkeeping for iPad is the best app available and illuminates the need of a pc for doing your books. It is simple to use and very comprehensive at the same time. I have tried many different apps and this one is the best. It would benefit from the addition of tax submission software being added to the app but a big thumbs up. I'm a part-time accountant with a handful of small to medium-sized clients. This app is perfect for me and represents outstanding value. I found the transition (from Sage after 20 years) simple enough, but I can see that a non-bookkeeping mind might find it less than intuitive. A multi-company, multi-currency, global bookkeeping app is an ambitious project and I think they've done extremely well. I researched a number of bookkeeping apps, and this is by far the best. It links in with my contacts, so I can sync my customer details with my contacts. We ave a sloe trader business, and although we don't use all of the features included, it means. That if we were to expand, I wouldn't have to try and find a new app, it is really future-proof. The customer service is amazing, I asked a question about registering gift vouchers, and the developers adapted the programme within 2 days for me!!! Other correspondence has been answered within a day. Highly, highly recommended! This app should carry a warning that it is not suitable for small business owners only professional bookkeepers and accountants. Pre-sales support is also thin on the ground and very abrupt. It looks good and comprehensive but difficult to use and confusing. It appealed because I travel internationally and the multi-currency feature attracted me. The manuals are not detailed and a tutorial video may have been helpful. A trial version like Easy Books do would avoid bad reviews as this may be a great product for professional accountants. Waste of £13.49. Sorry!!! Agree with previous reviews. For sole trader, it is overly complex. Too often, an error in entry can take ages to correct, unless you are an accountant. Frustrating because other aspects are good, but when you make an error, the support is poor. The available manual doesn't help. Way too over the top for sole trader but i can see it working for a larger company. A stripped back version just doing sales, purchases, paid, unpaid, clients, suppliers, banking and reports etc. would be good for smaller business use, too many screens at the minute to do anything at any speed. Would be good to be able to add photo of receipt/invoice too? I'm sure this would be a fantastic app for an accountant, but for anyone else I think it is just far to complex. Yes it looks good, if your an accountant then you'll be fine, it's just too complicated. I was hoping to start saving the £700 a month my accountant gets from me. This is a great app and for the price, you can't go wrong. It does everything I need and email support is excellent too ! Excellent app, does what it says on the tin. I had been looking for an accounting app for a small company my son owns and could not find anything of any worth until I say this. At just over £10 I thought it was worth a try, what an inspired purchase, does everything I need to look after the company's accounts, as good as if not better than the packages you can buy for computers/laptops. All in all the best accounting package for the iPad on the market. It seemed just what I was looking for but it does not work. Trying to set year start date causes a crash. App will not run without year start date. Trying to edit set up causes app to lock. I have emailed support, I hope they respond, watch this space.